Here’s a melange of interesting autumn images that I’ve come across this past September. 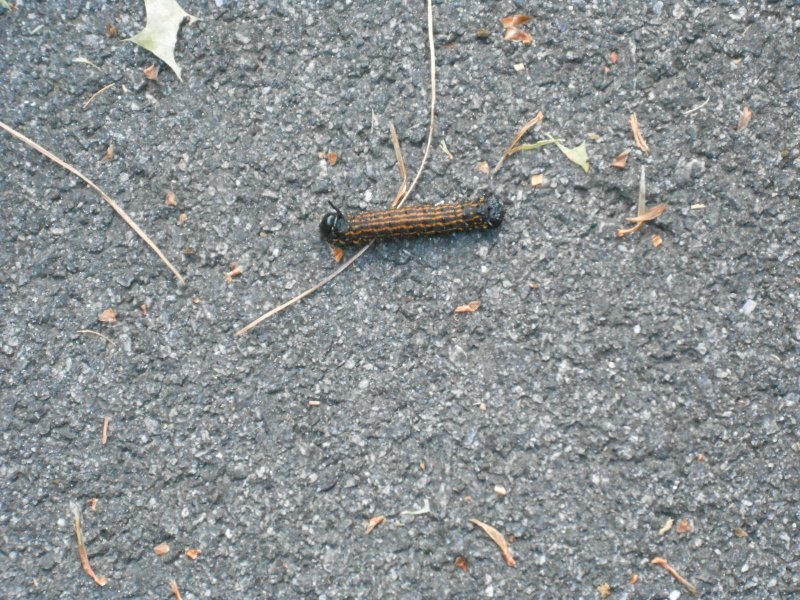 One Friday afternoon, while riding the bicycle trail from Coventry, Yang and I came across these funky caterpillars. 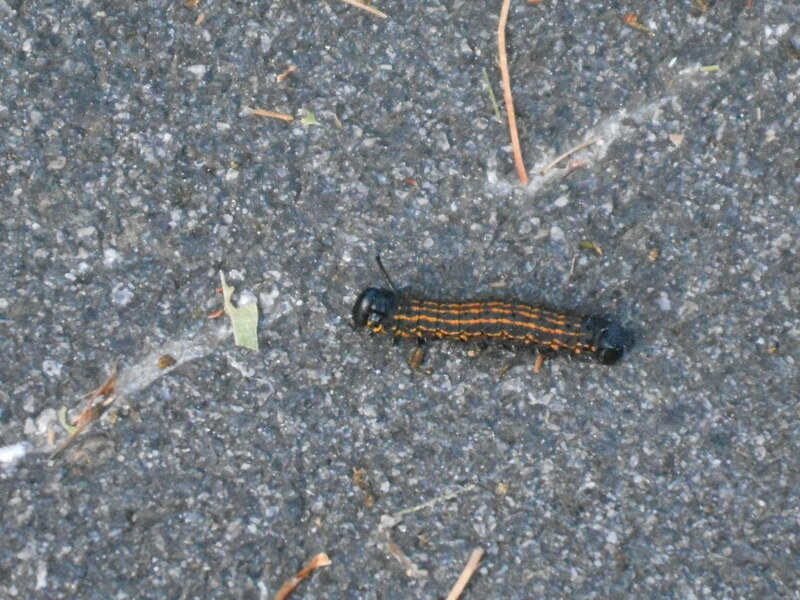 We’d seen them last fall on the same trail, so apparently these are their main stomping, er crawling, grounds. Does any one know into what they ultimately metamorph? 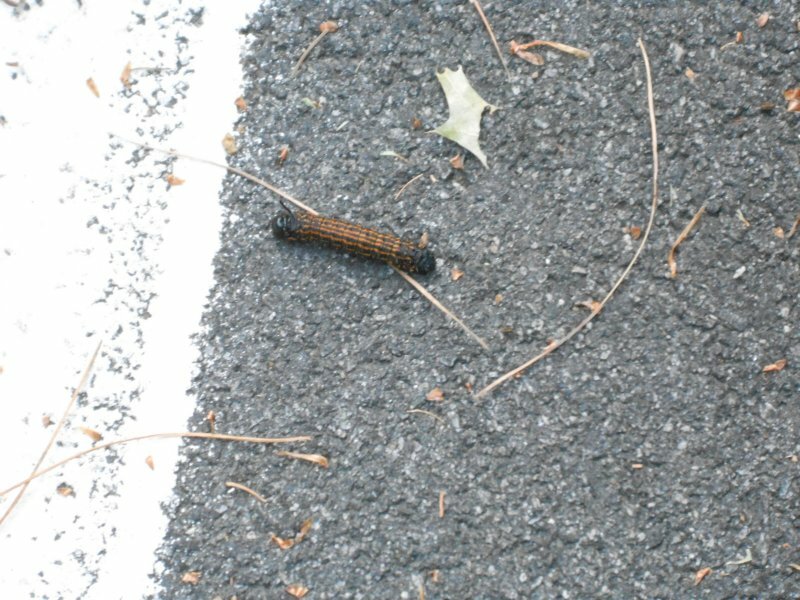 Notice how they have prongs on their derrieres, no doubt to confuse predators as to which end they are biting. We wonder what these guys are. The following weekend, we did 22 miles on the Nickerson Park Trail on the Cape. 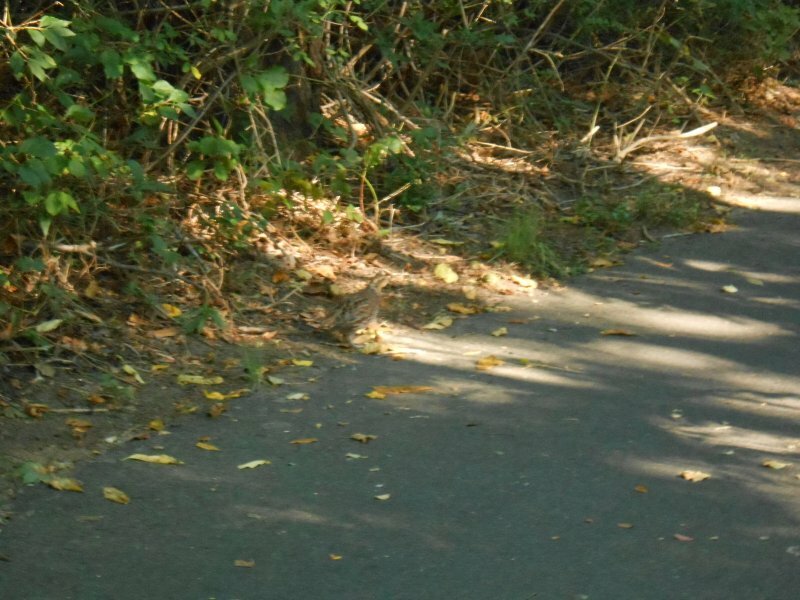 What should we see on the trail but this adorable quail! 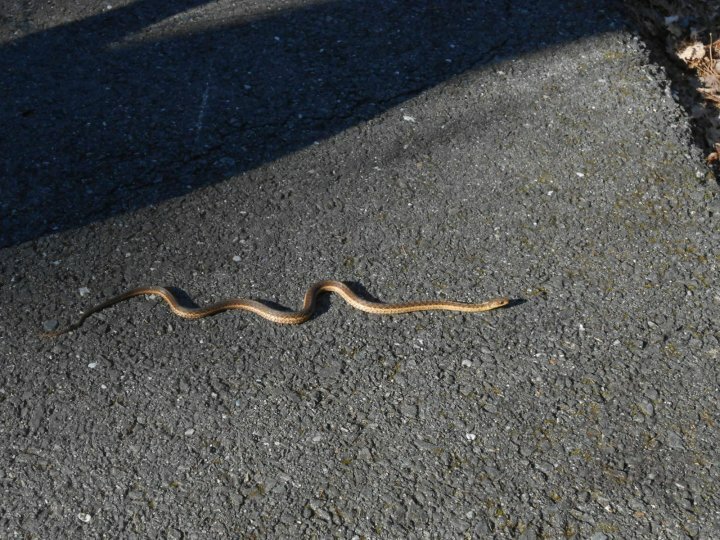 I suspect s/he is domesticated because the little critter did not seem at all unnerved by passing cyclists or walkers. I’ve seen pictures of domesticated quails on line, and this little guy seems to match up. Nevertheless, I’m counting him/her as one of my bird sightings for the year. I hope you can see the little guy in the center of the picture to left on the trail, almost in the leaves. Click on the image for a bigger picture. 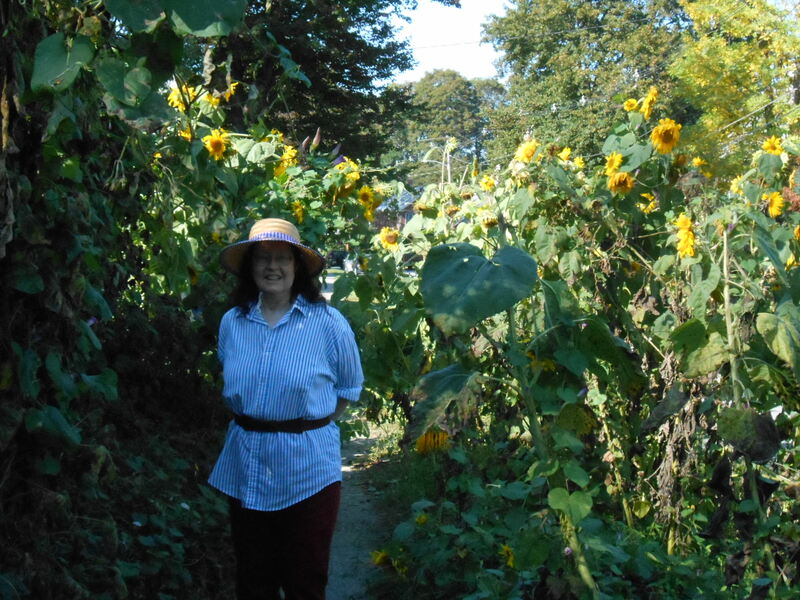 Though not nearly as cute, here are some pictures of me in Brattleboro, VT. Every year this house creates a tunnel of enormous sunflowers. We went up last weekend and took these shots. The house used to also have a hutch for chickens and bunnies, but alas, those adorable creatures are no longer kept there. I’m not quite so adorable as a bunny, but I like to think I have some charm. Yang staged the photos nicely, don’t you think? Is there anything he can’t do? 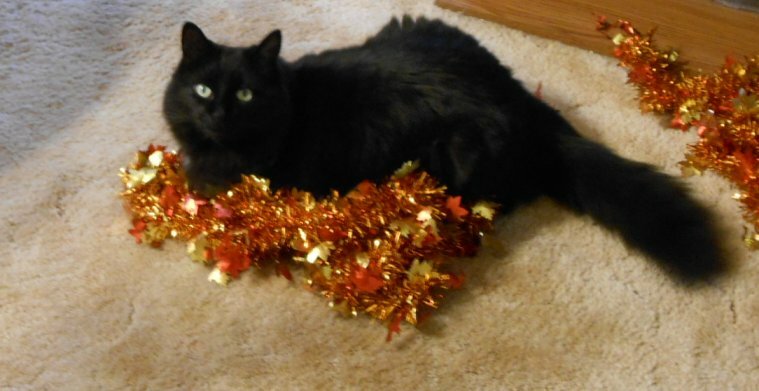 Finally, Natasha desires to send you the best of autumn holiday greetings! 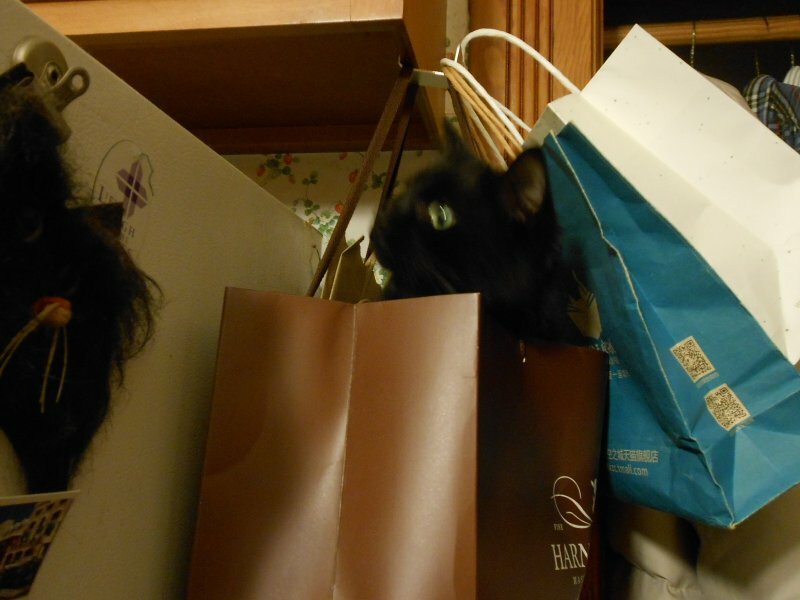 Rosie wants to photo bomb Natasha’s greeting – and Natasha is NOT amused. 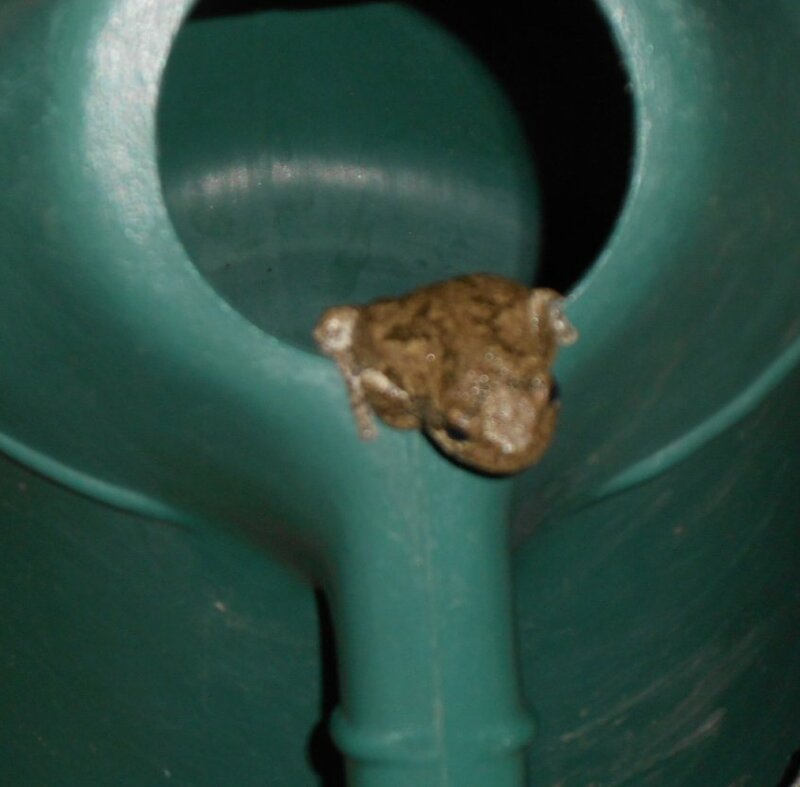 Yang went to pick up the watering can for the plants the other evening, and this is who greeted him. 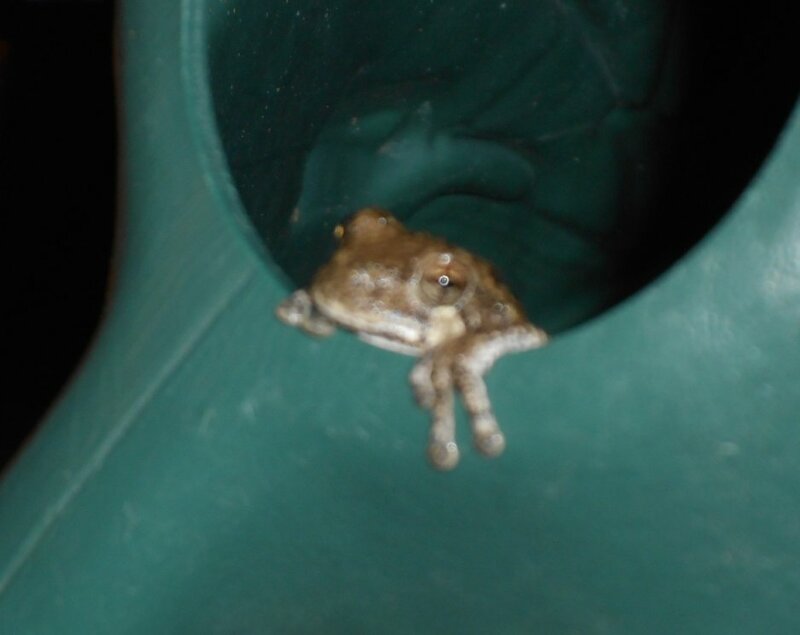 My friend Sarah tells me that he/she is a grey tree frog! We always have plenty of toads in the yard. In fact one used to sit on a floating platform in the fish pond and sing away the afternoon. However, I didn’t even know we had these guys in our yard! Quite the cutie, isn’t she/he? 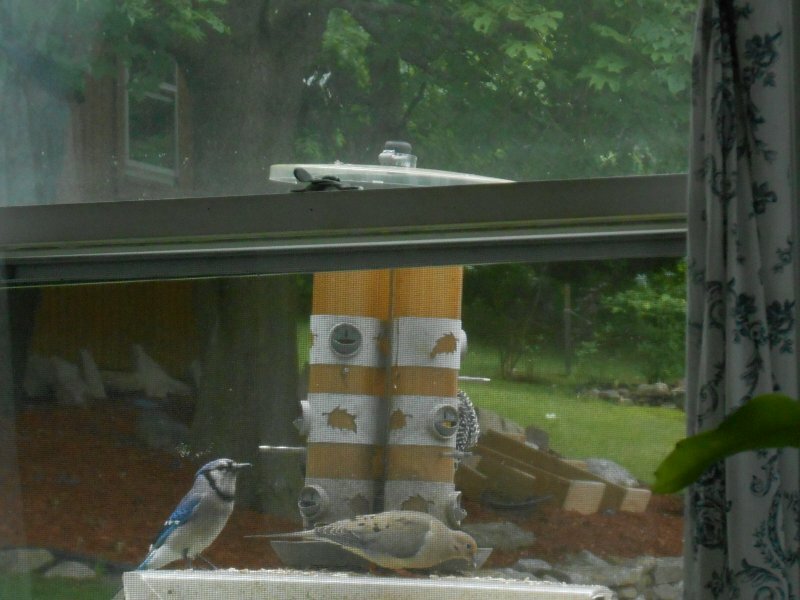 Here, you can see, from left to right, a Blue Jay, a Mourning Dove, and the edge of a shy (or hungry) Red-bellied Woodpecker’s wing. I always get them mixed up with the Common Flicker. I can tell the difference in how they look; I just can never remember which name goes with which bird. 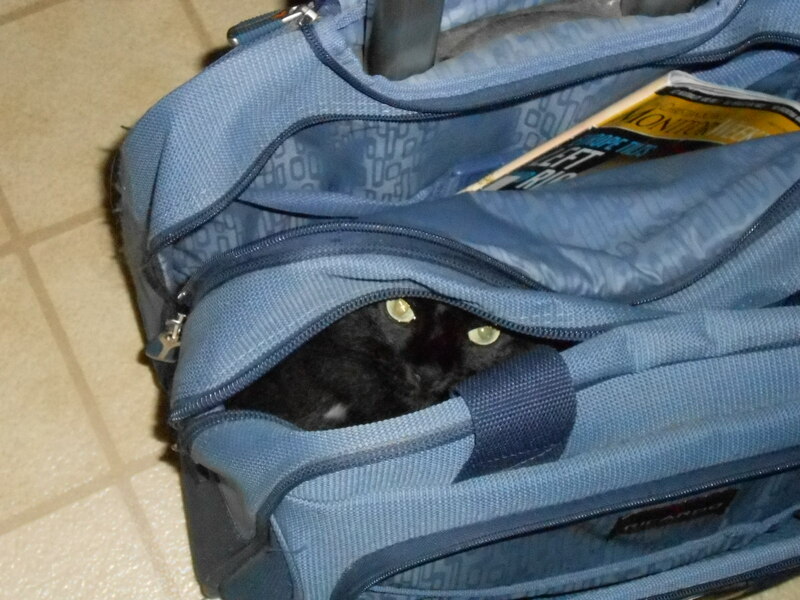 Ah, here he is peeking out at us! 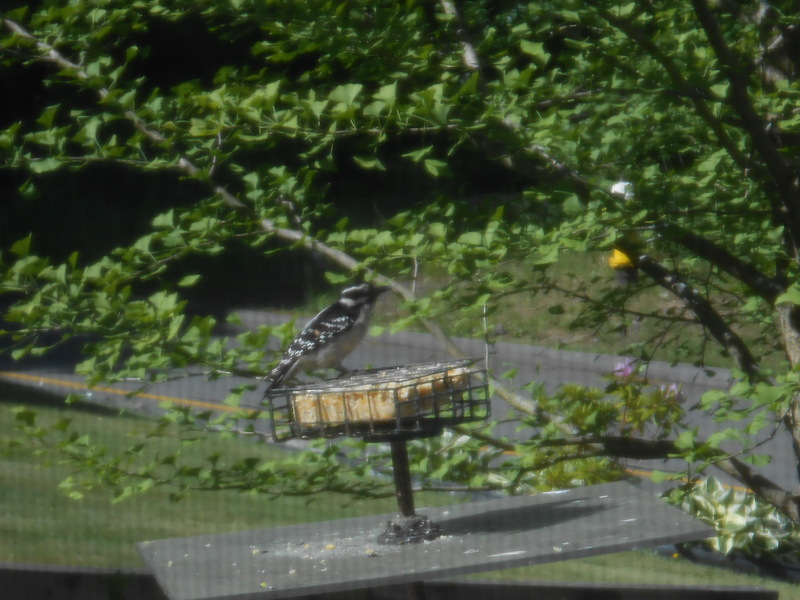 Here’s a Downy Woodpecker. It could be a Hairy Woodpecker. I know the latter is bigger, but I can’t exactly make the comparison here. I also know the Hairy has a longer beak, but unfortunately the picture is not quite sharp enough. 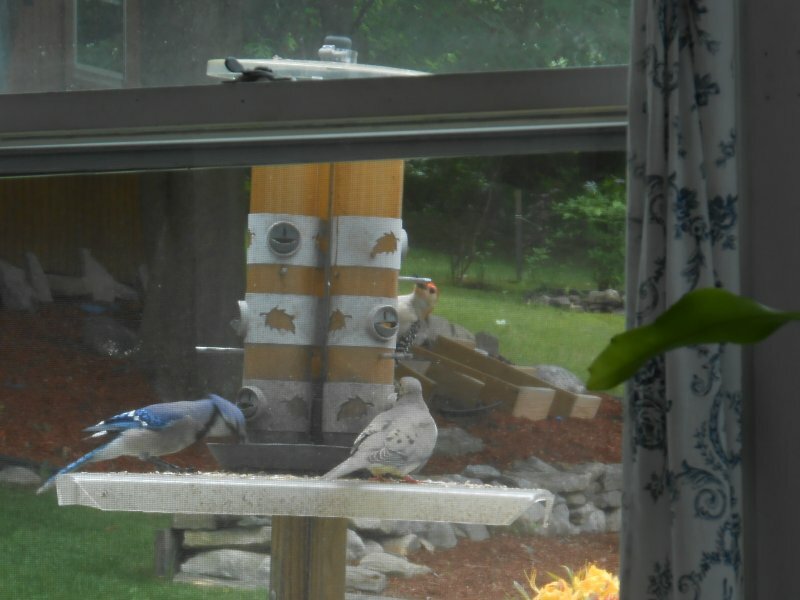 We get both types, as well as Flickers and Nuthatches. No Piliated Woodpeckers, though! 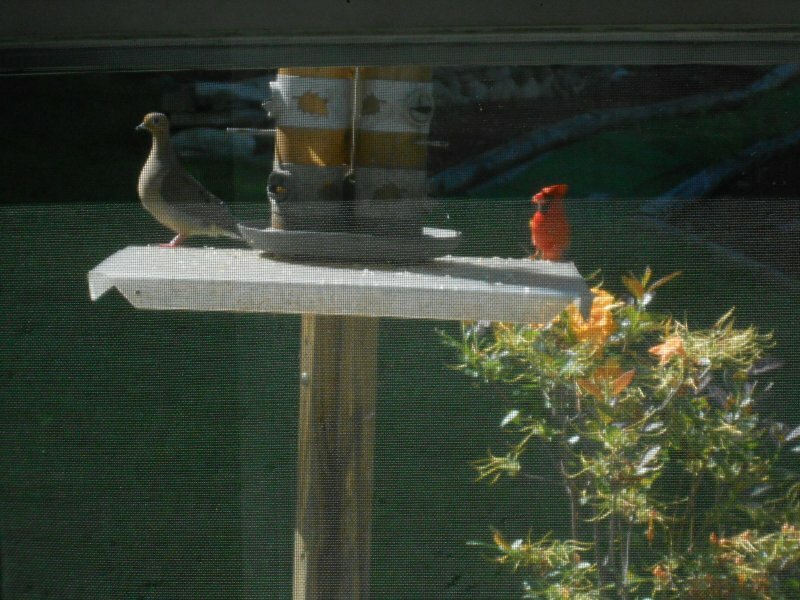 Next are a Cardinal and a Mourning Dove. Some of these images aren’t as clear as they could be because I had the screen down on the window and had to shoot through it. 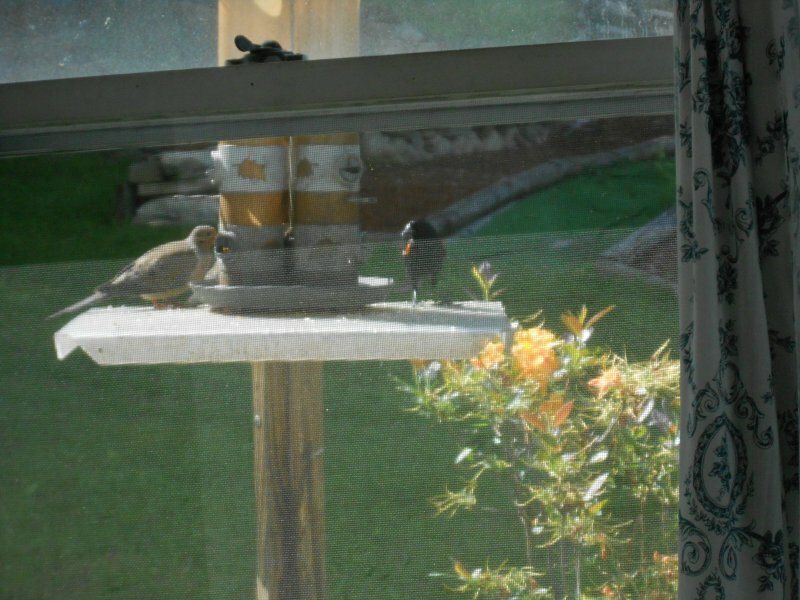 Darned old Mourning Dove with a Red-winged Blackbird. The Blackbird is hard to catch. He comes by all the time, but always seems to see me and fly off before I can get a good shot. I’ll have some more bird pictures later with him in it –– as well as other birds. 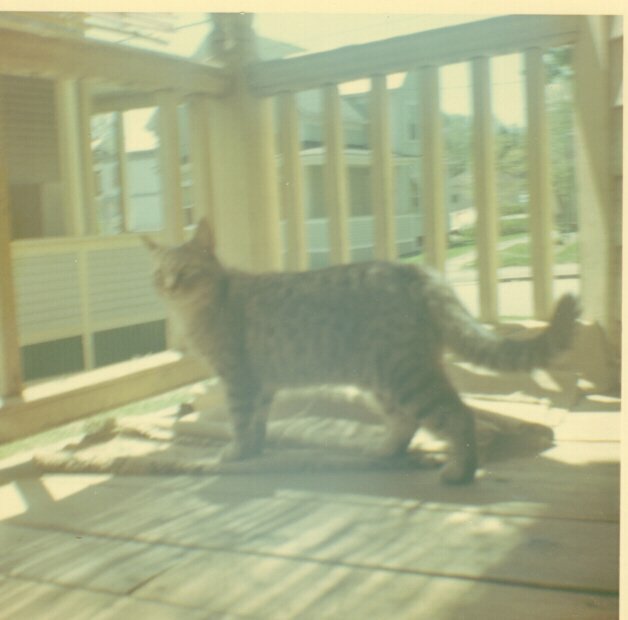 I would also love to get a shot of our Catbird. She is forever landing nearby and popping around looking for food or getting a drink from the bird bath near the fish pond. All I have to do is hold still and she’s my buddy. 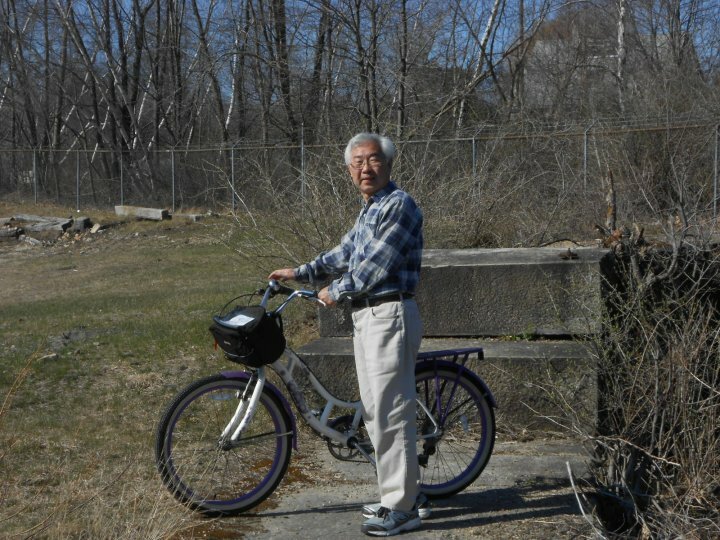 I’m happy to say that on our bicycle rides, Yang and I have seen a plethora of Catbirds, Red-winged Blackbirds, and Song Sparrows! 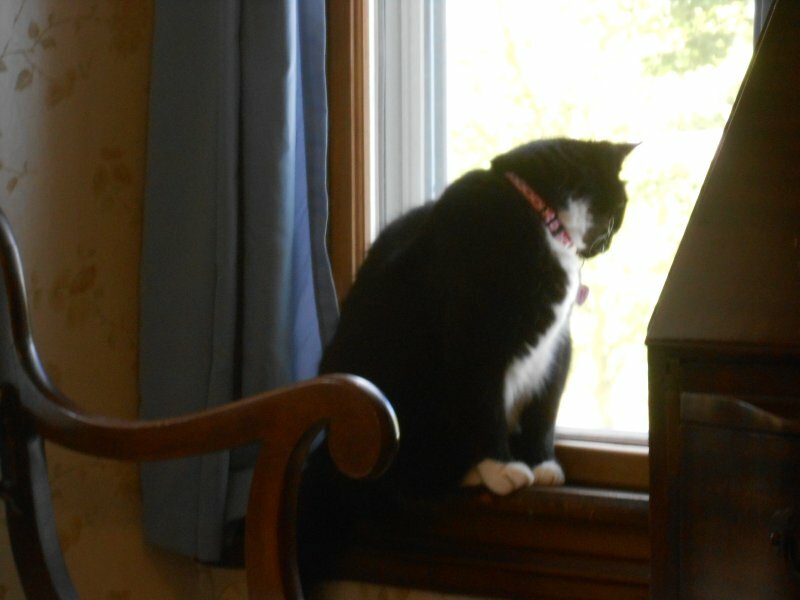 Oh, and by the way, Yang and I aren’t the only ones in the house who like to bird watch. When we went to Plainfield for me to participate in the Sisters in Crime panel on creating mysteries, we stayed over night in Plymouth, NH at one of our favorite places, the Red Carpet Inn. 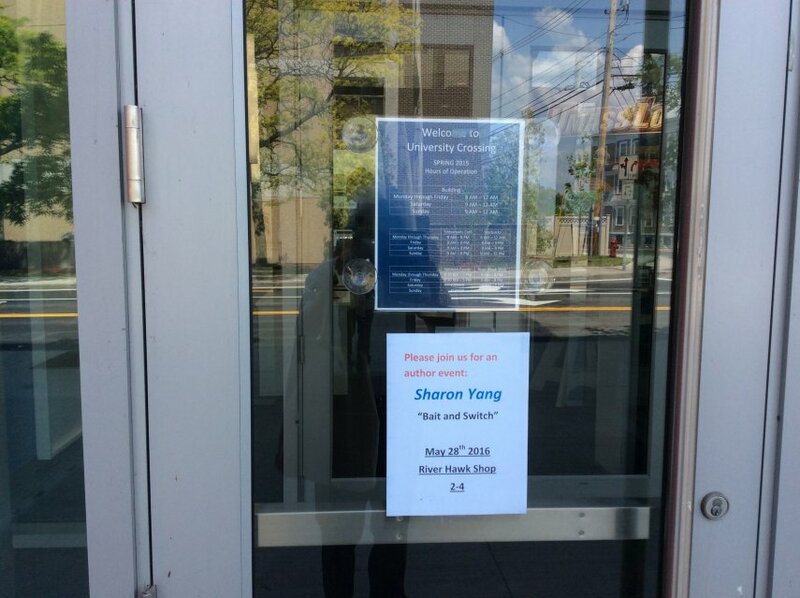 For years Yang and I, myself alone, or myself and a pal had stayed there for the Medieval and Renaissance Forum when it was at Plymouth State University. It’s always been pleasant. Look at the beautiful view we had from our window! 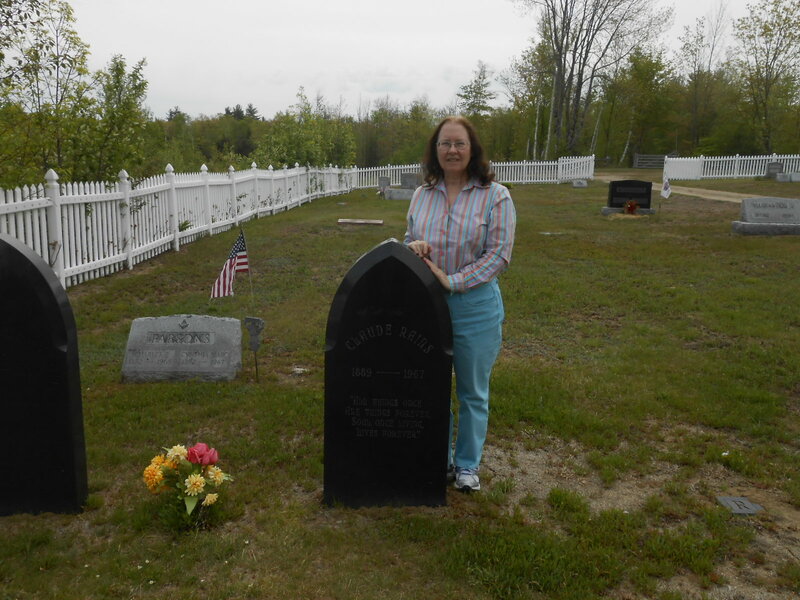 The next day, we drove over to the Red Hill Cemetery where Claude Rains is buried with his wife Rosemary. 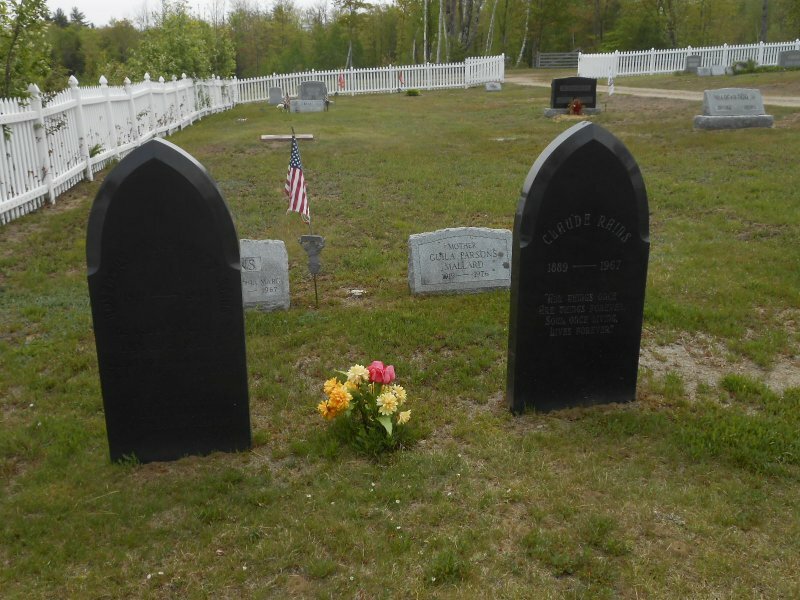 He has a beautiful epitaph: “All things once are things forever, Soul, once living, lives forever.” His wife’s is a variation on lines from Christina Rosetti’s “When I Am Dead” Sonnet – one of my favorite poems. We always try to pay a visit. Just a simple way of saying, “Thanks for the great celluloid memories.” It’s a special treat to know that my favorite actor is resting near me. It almost feels like we’re neighbors. Don’t they have a beautiful view? That’s Red Hill in the background, which Yang and I try to climb in good weather –– we’re tired afterward, but it’s worth it. When we stopped in Center Harbor, I found a neat independent book store, Bayswater Book Co. (12 Main St.). Of course, I scoped out the lovely little shop –– and ultimately managed to make arrangements to give a reading and signing on Saturday, July 9th, from 1:00-3:00. Drop by and meet me. Bait and Switch‘s Dusty will be be on the lookout for you! 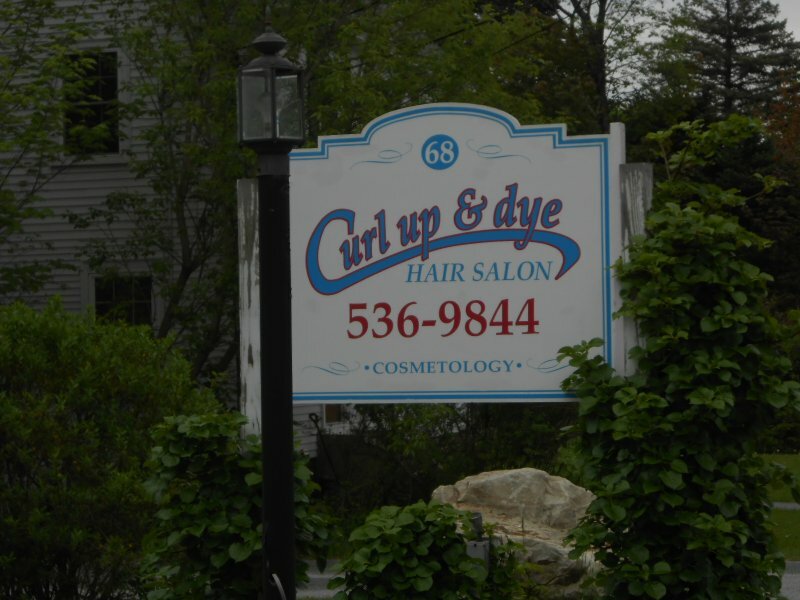 I always wonder if this pun carries exactly the right connotations to bring in customers. It must work, ’cause it’s been there for like 20 years! 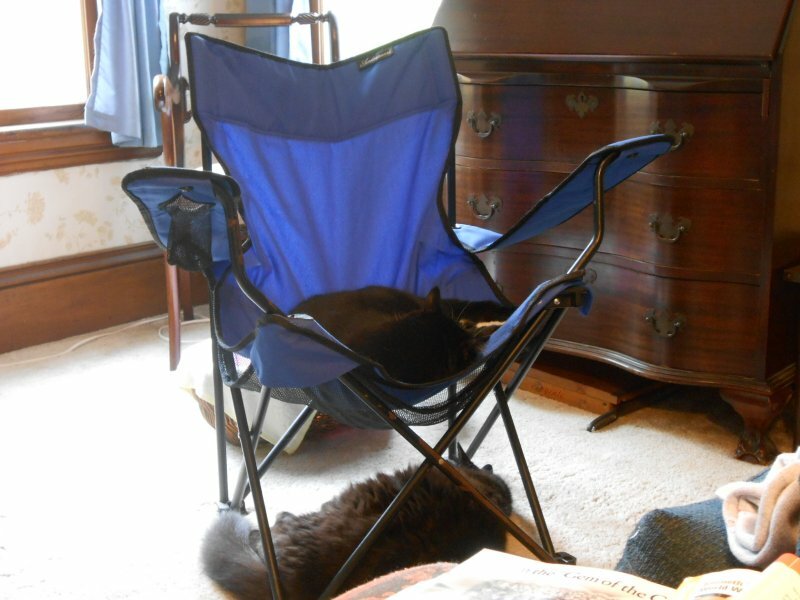 Once we got home, we were happy to see that, on occasion, Rosalind and Natasha can rest peacefully together. 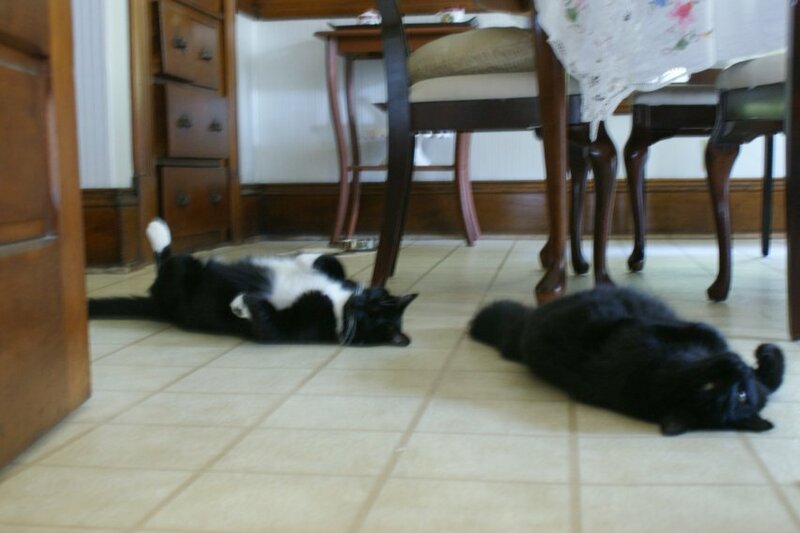 The Moe will lie down with the Curly. 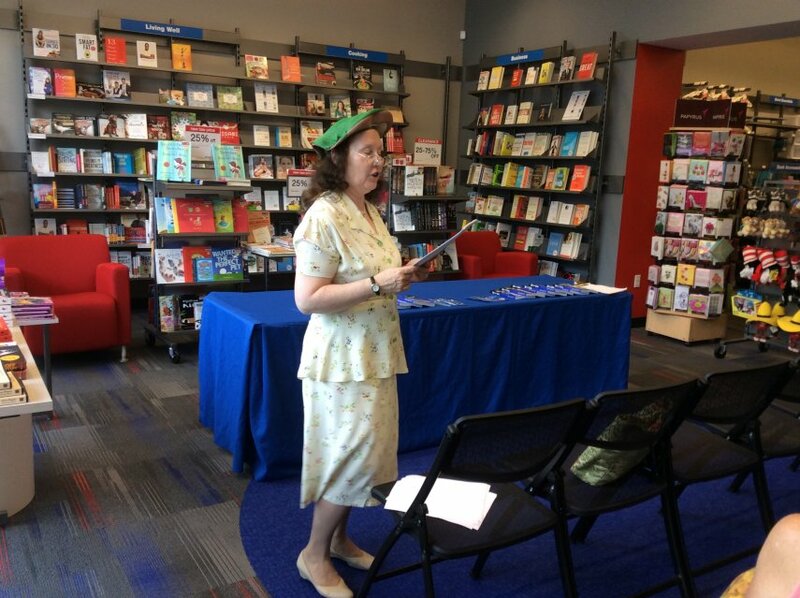 So, on May 28th I gave my final reading of the month at my alma mater’s bookstore, River Hawks. 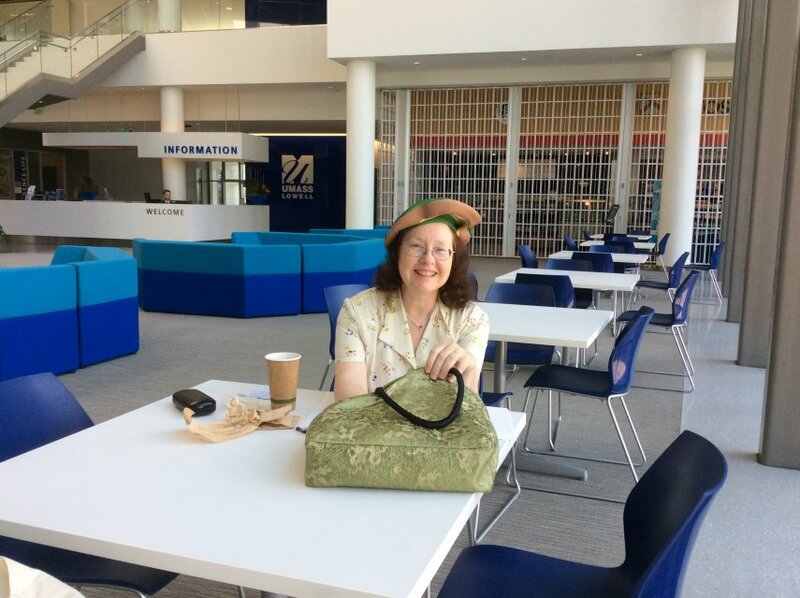 It wasn’t exactly a trek back to Tara, but it was a wonderful experience for seeing so many old friends at UMass Lowell. First of all, the day was a scorcher: in the 90s! Of course, I had to have a hot cappuccino before my performance! Thank God this place is air conditioned – but the nice, comfortable kind of air conditioning, not the Arctic temps that make polar bears shiver, which you find too often once May rolls around. Here, I’m sitting, looking over my notes and finishing my coffee in the lobby. The building is really nice, with lots of windows and airy space. Ham bone that I am, I had to get a picture of myself with the display for my book! The young woman clerking at the counter was nice enough to do the honors. Like the dress? Yang made it for me by copying a vintage dress I’d bought on Ebay. This way we get the beauty of authentic vintage design combined with the convenience of material you can hand or machine wash! There’s not much he can’t do: from using physics to move boulders to building an oxygen chamber for a kitten recovering from double pneumonia. 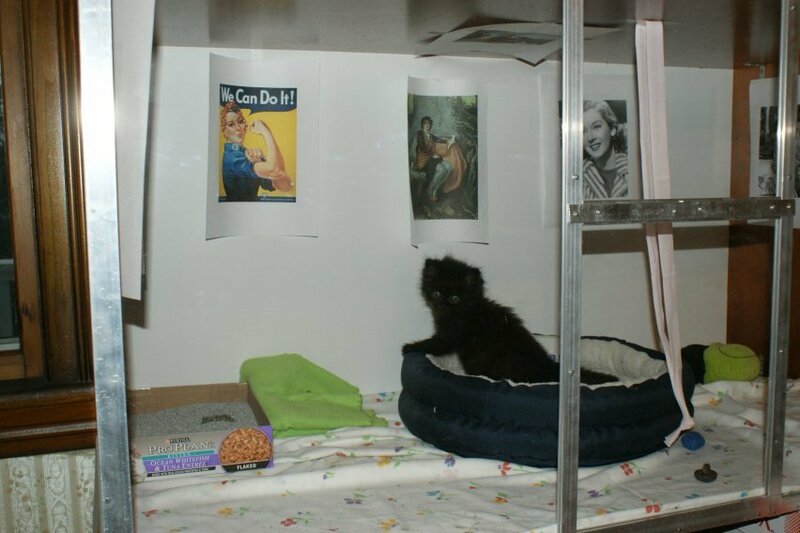 Note the luxurious quarters: litter box, bed, blanket, toys, and inspiring pictures (Rosie the Riveter, Rosalind in AYLI, and Rosalind Russell). Before the session, I had a nice chat with Abbey and Christina, who had taken charge of setting up the space for me. As you can see from the pictures, it’s a great area for doing a reading. What I could really kick myself over is that I had such a wonderful time seeing old friends that I forgot to have my entourage (Yang) take any pictures of folks. Damn! Not even a group shot! So, who’s on the red – or here royal blue- carpet? Sue Thorne-Gagnon and her husband Bobby were first to arrive. Sue and I were at ULowell together at the same time, but darned if we never met until years later when we were working at BASF systems before we both went back into teaching. She’s a wonderful teacher and flutist. Next came Lisa McCarthy and her daughter Hedda. 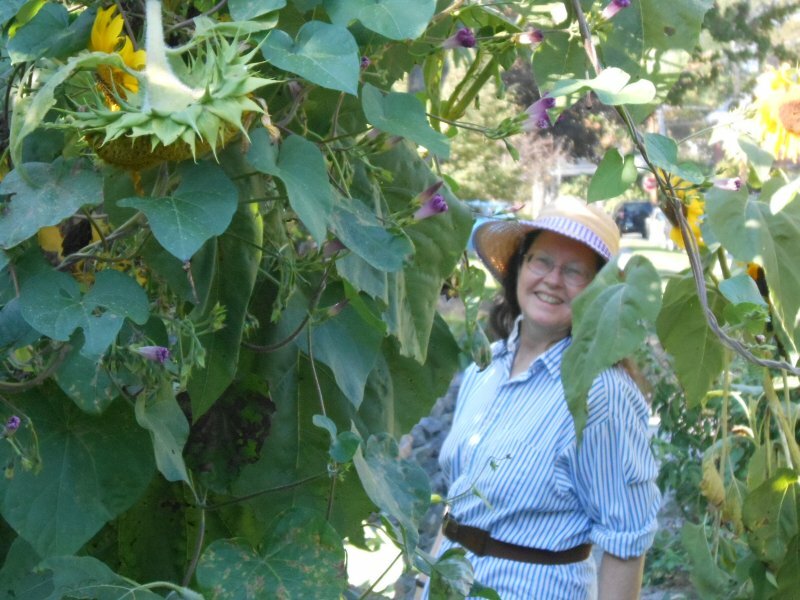 I’ve known Lisa since the late seventies, and we’ve been through everything together from rambles around Boston, hikes through the woods, and Star Trek conventions. My nephew Phil and his wife Steph also appeared on the scene. Steph is responsible for addicting me to Psych; Monk; Murder, She Wrote; and Miss Fisher’s Mysteries. Can I get her hooked on Murdoch? Steph is a teacher and Phil is a filmmaker – check out his co-production of My Name Is Jonah. When he and his older brother were kids, I used to hold them under the arms and swing them in a circle, which they loved. Now they can do it to me, but not at the reading. Here’s a picture of my giving Geoffrey a whirl. After the reading started, I was so excited to see, first, Barbara DeMeuth then Mary Lou Beausoleil slip in! These guys have been my friends since grammar school! Clearly, they have much forbearance. It was fantastic that they came to support me! 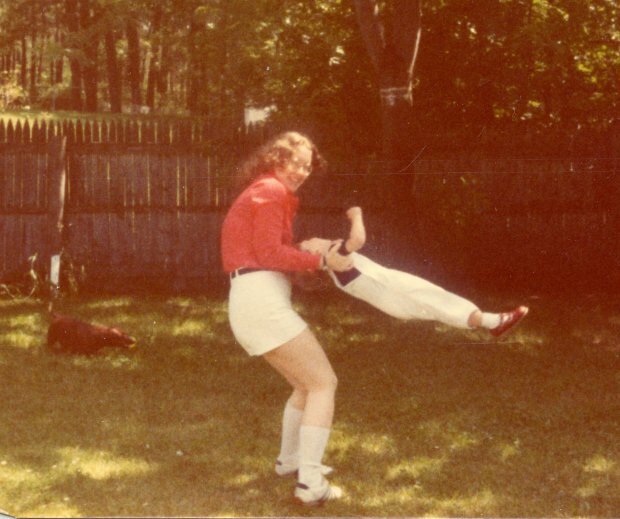 Barb is actually my oldest friend – not in age but in duration. We met when we were going into the fifth grade. Mary Lou is only a few months behind. But we can’t get together as much as we’d like, so it was fantastic to catch up! Mary Lou was one of the earliest readers of one of the earliest versions of Bait and Switch – and she still came, anyway! Barb and I have managed to stay in touch on the phone or over an occasional lunch lo! these many years. Both have wonderfully wicked senses of humor! It was an absolute delight to see people I care so much about, and who showed me they cared by being here to share in the success of Bait and Switch. And thanks to Maria Shusta, Christina, and Abbey at River Hawks for doing a wonderful job of setting everything up for me and making the day run so smoothly. 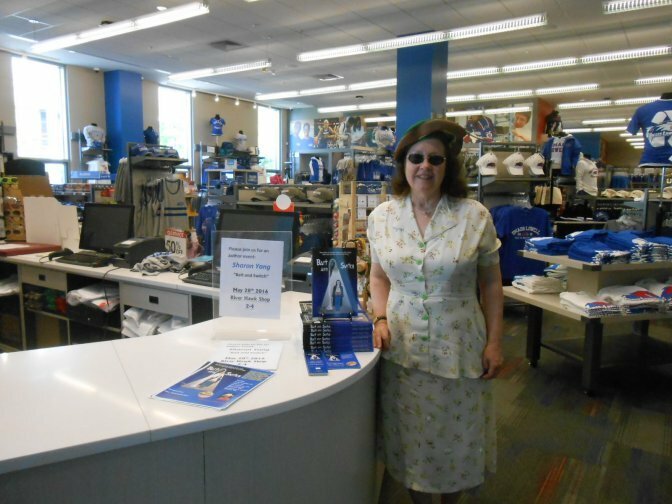 So, if you’re a friend from the Merrimack Valley, old or new, who missed the reading but still would like to get Bait and Switch, they have copies awaiting you at the River Hawks Bookstore, 220 Pawtucket Street, Lowell. Dusty from Bait and Switch will be watching for you. We recently did the North Central Pathway rail trail. It technically extends between Gardner and Winchendon, though there is a break of about a mile that has not been developed yet. 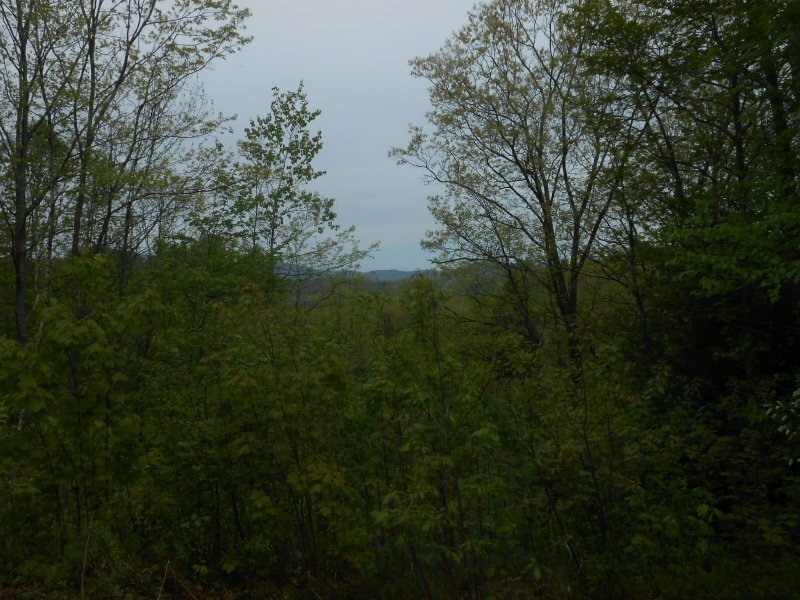 It’s a beautiful paved trail that runs through clear, lovely, green woods in a straight path. 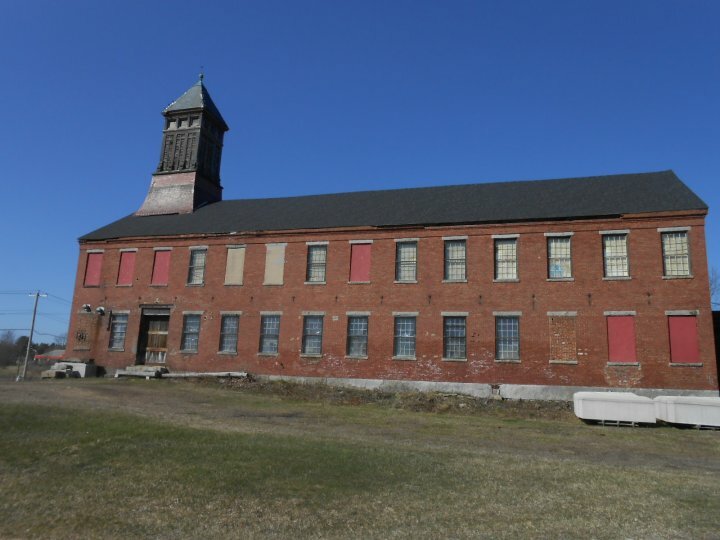 At the Winchendon end, we cycled down toward a sports/recreation area, but right off the trail is this cool abandoned factory and what appears to be a ware house. It’s all next to a set of falls and canal off the river. Since there weren’t any “No Tresspassing” warnings or locked gates, we checked out the area, being careful not to take any risks of falling or hurting ourselves. 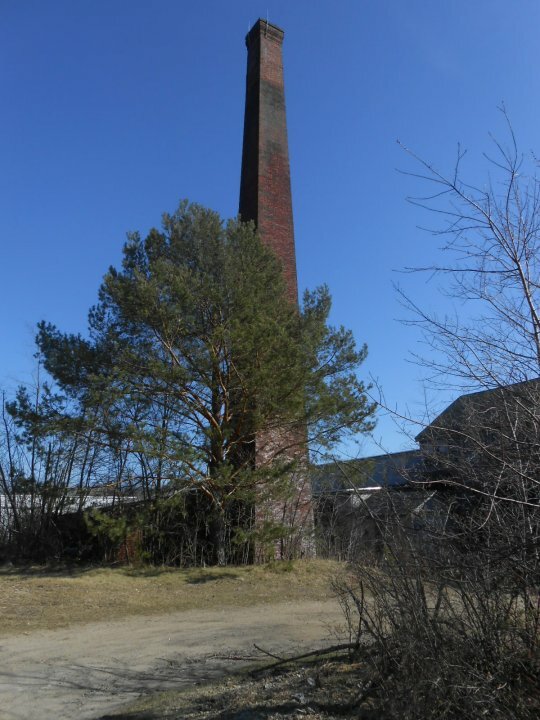 Here’s a picture of a smoke stack; somehow the rest of the factory seems to have fallen away – although there was a building behind it that looked as if it might have been part of the original manufacturing site. Look at how gorgeously azure-blue the sky was that day. The sun was so bright, I had to wear my shades – prescription, of course, or I’d have been riding off the road. 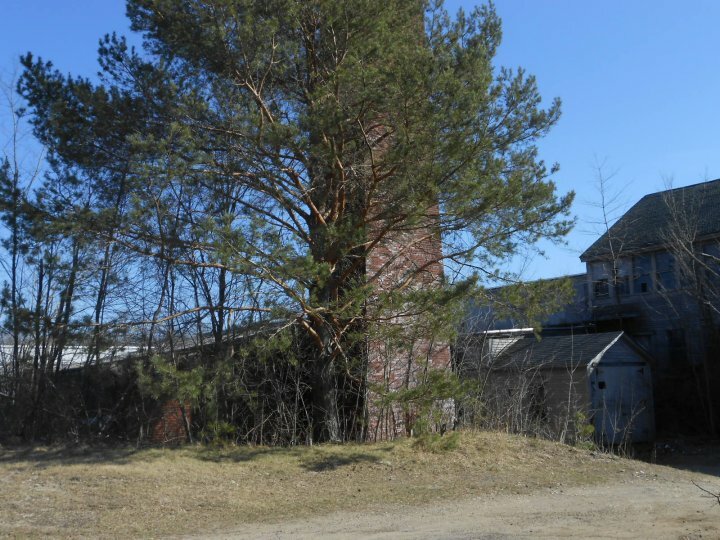 In this other shot of the chimney, you can better see the tree growing up around it and what’s left of the building behind it. 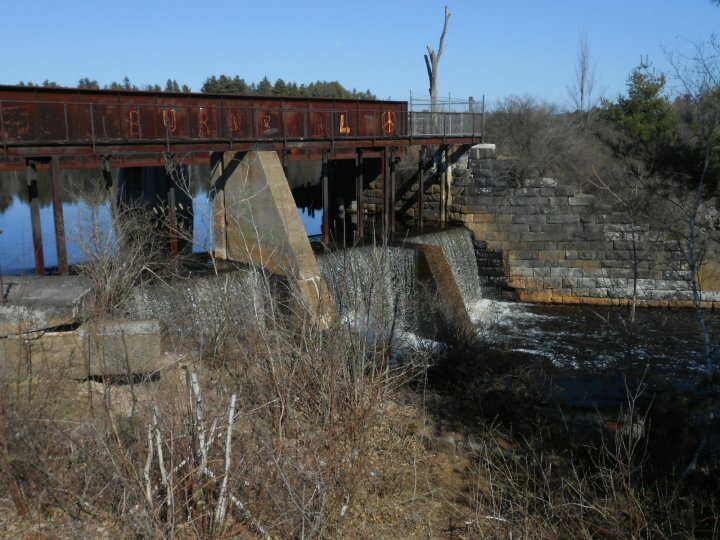 There were man-made falls next to the buildings and a canal running along it for water power. The scene was beautiful. I have no idea what they made here. Since this town was the rocking horse capital, perhaps that’s what they produced? We got back on the trail for our return ride, passing a pond that had some Barrows Golden Eye Ducks. Would that they had been close enough to photograph. These are diving ducks. So it was a hoot to watch the flock sit up on the water, flap their wings, then dive down and disappear beneath the surface for a stretch. Then, up they’d all pop. Now you see them, now you don’t, now you do! We did get to photograph some cute critters, though – at least I think they are cute. So, here’s the trigger warning: PICTURES OF A SNAKE!!!!!!!!!!!!!!!!!! I almost ran over a little one of these guys when he was trying to cross the trail. I guess he wanted to get to the other side. Playing chicken? He was too small for me to see right away, but Yang assured me he was okay. Then, I came across his big sister right here. A beauty, eh? I don’t know what kind this one is. 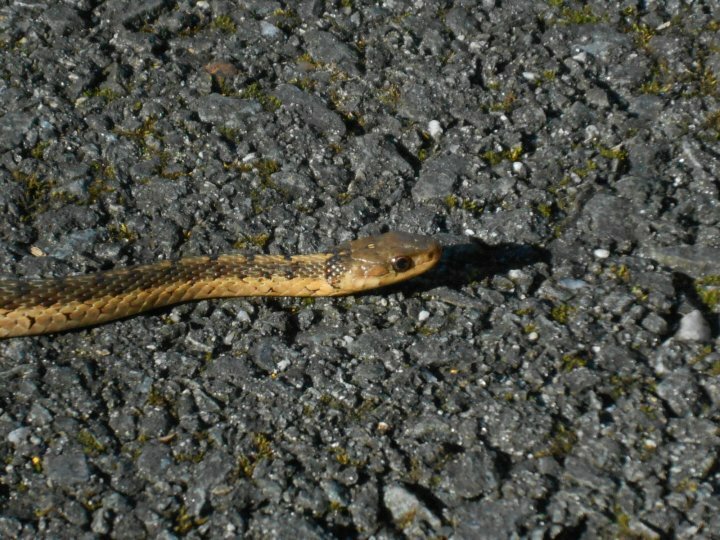 His/her color is coppery with darker markings, so it doesn’t look like a garter snake to me. What do you think? Can anyone answer my query? So, for those freaked out by this lovely creature, here are some soothing images. 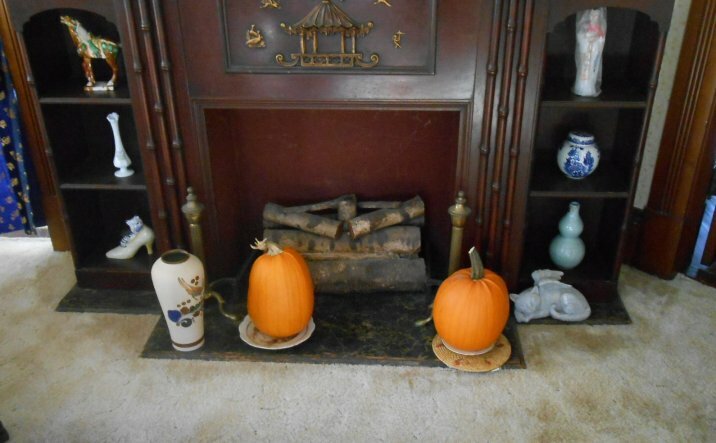 First, the ginormous (for us, anyway) pumpkins Yang and I grew last year. 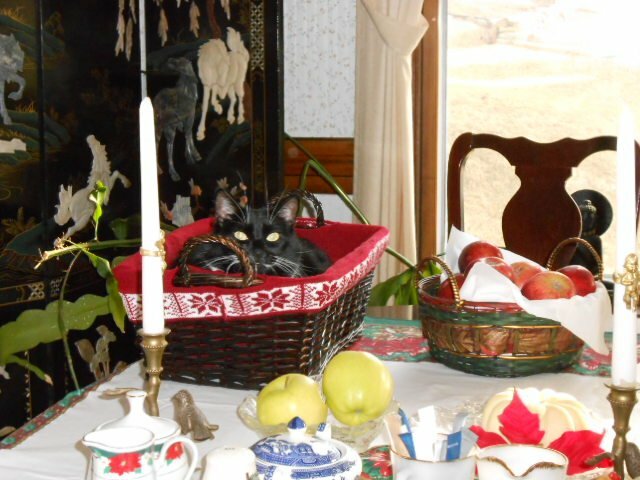 Then, Yang, himself, always a calming influence. So, you’d think these two were little angels: nice without a hint of naughty. 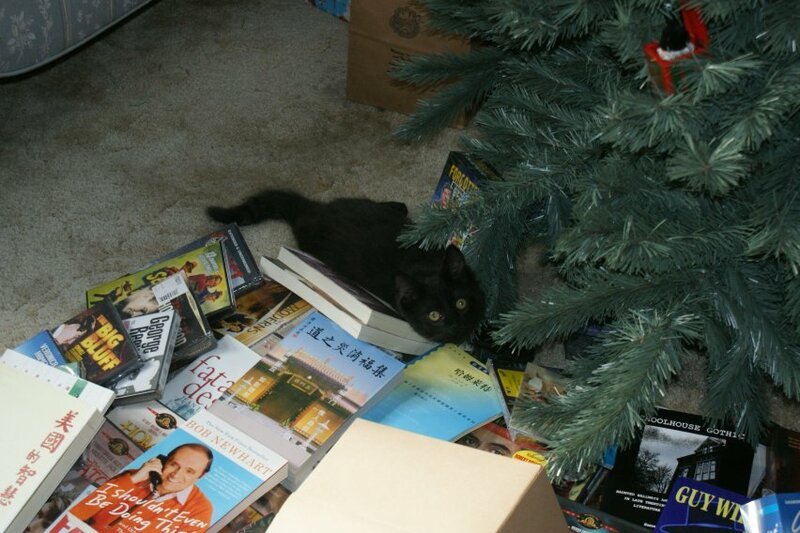 Albeit, Rosalind looks a little worried about which of Santa’s lists she’s on. 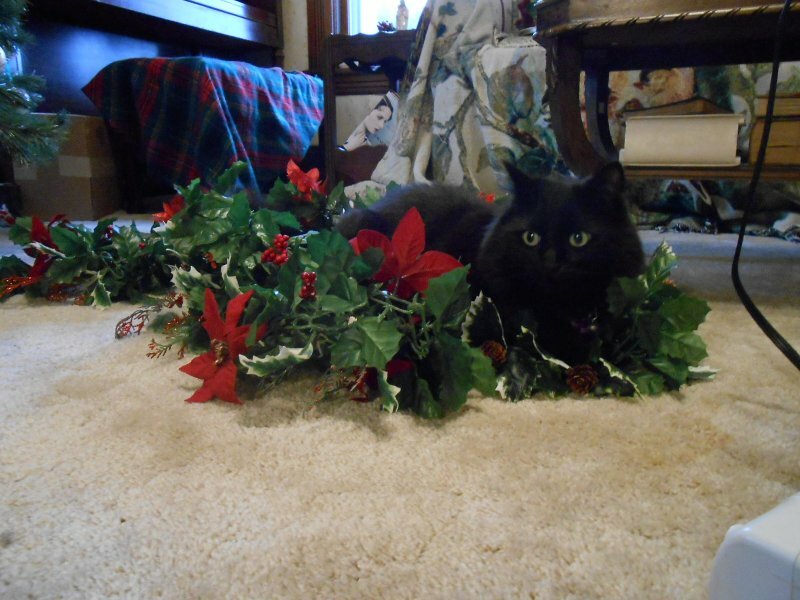 Still, look at Natasha as “O Little Cat of Bethlehem” here. Not so much. Here, you have the reason for the Great Christmas Blackout of Bethlehem, 2011. 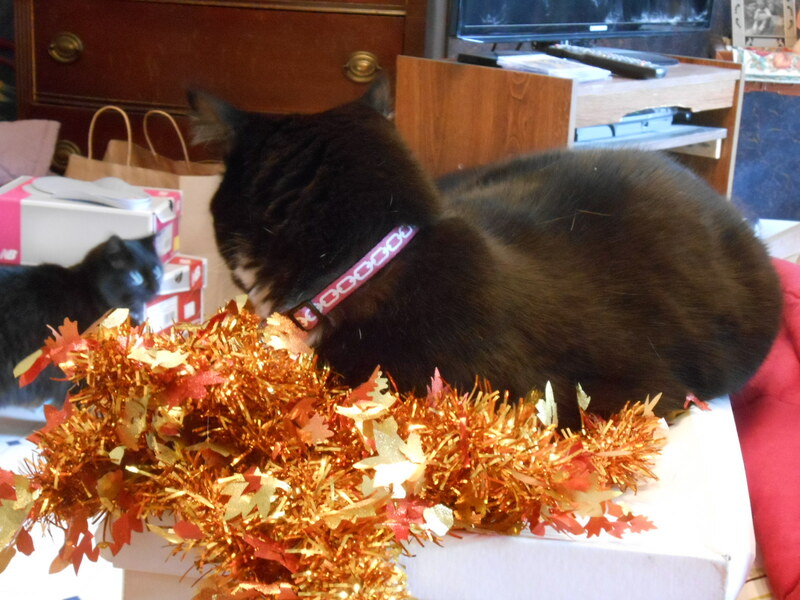 And of course Rosalind isn’t above diving into the fray to tear apart the pile of presents under the tree. 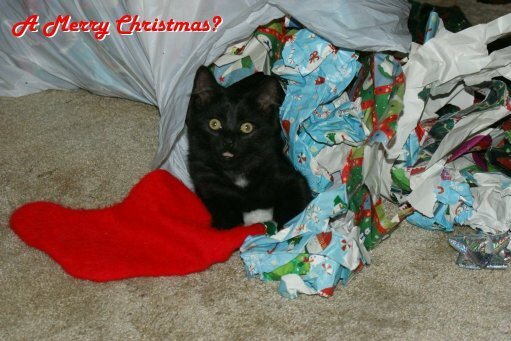 Popping out of a bag of wrapping paper scraps like the creature in Alien has its appeal for Miss Rosalind as well. 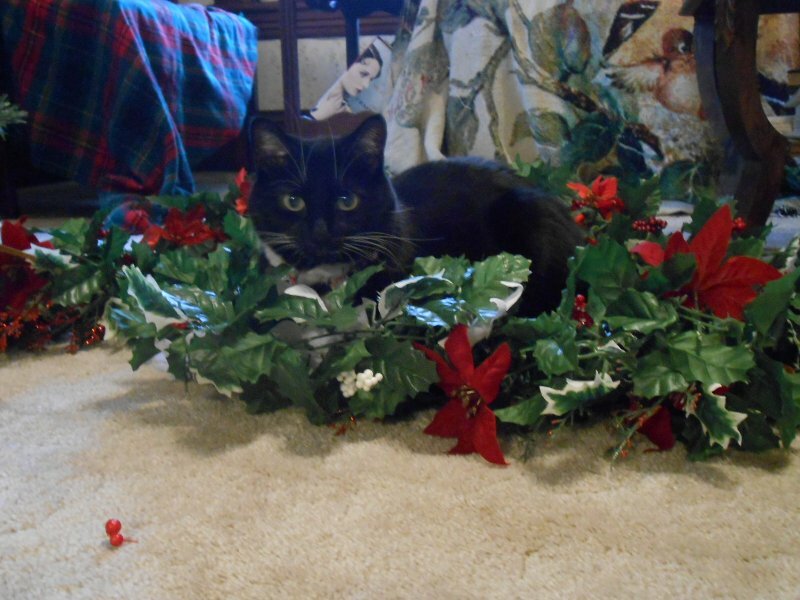 We used to blame Rosie for knocking ornaments off the tree and batting them around, often to be found under the couch, sometime in July. 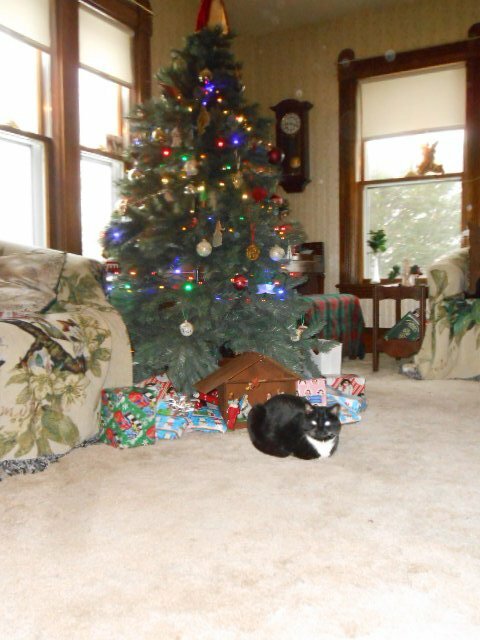 However, one day I came home to find Natasha sitting on the arm of the loveseat next to the tree, smacking down ornaments to her sister on the floor. 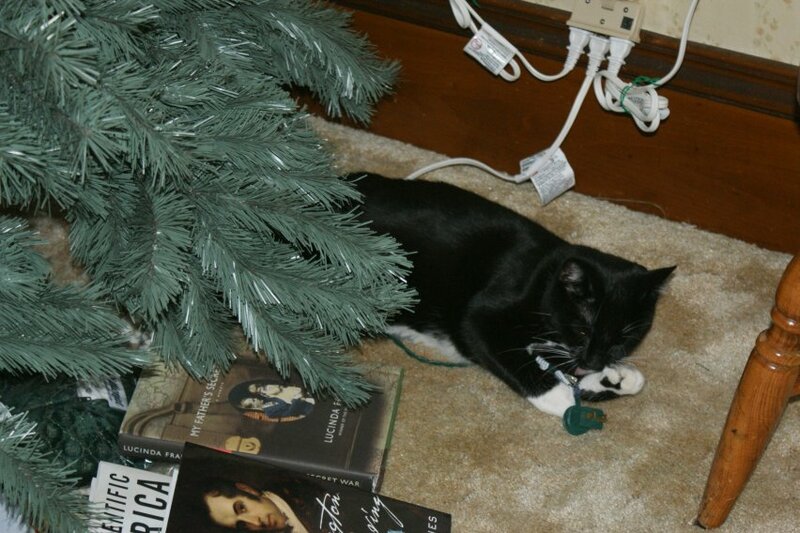 I was never quite sure if ‘Tasha were doing Rosalind a favor or just setting her up to get blamed for striking down the bauble with which we’d catch her playing. 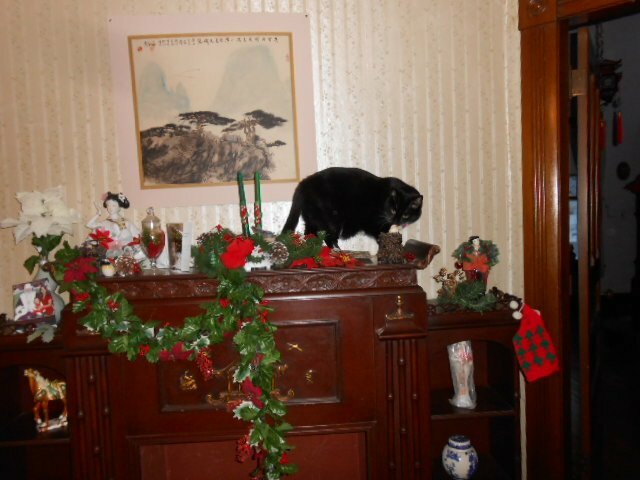 I don’t have any pictures of that, but I do have a couple of Natasha showing me that the mantle piece is not off limits in her book. 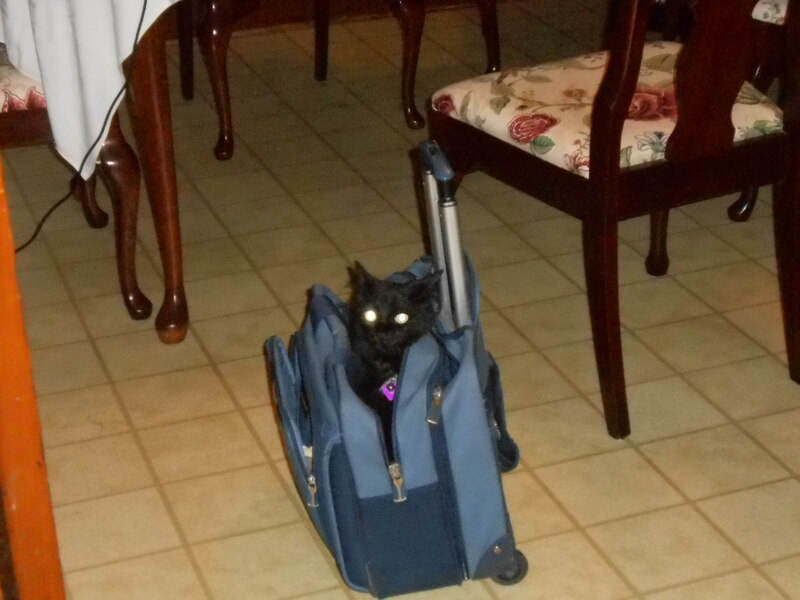 Natasha is also quite sly about getting around rules. 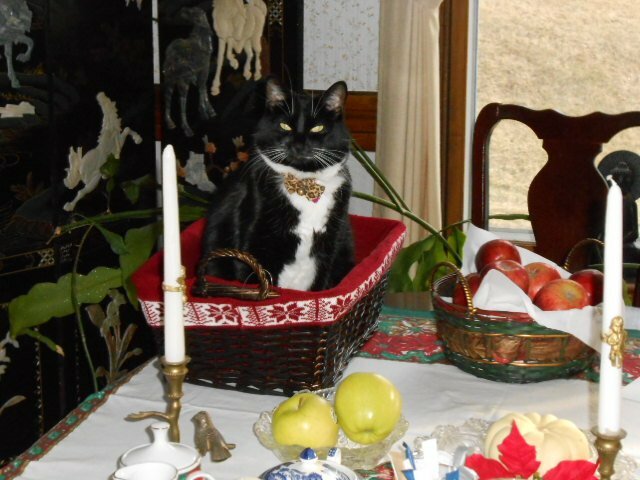 One cardinal one is that cats are not allowed to walk, rest, or put even a paw on the dining-room table. I’ve been fairly successful at ensuring they obey while I’m in the house. With the clever mind of a lawyer or a student trying to game the syllabus, Tasha found a way to sleep on the table without sleeping on the table. But at the end of the day, after gifts have been gnawed, paper has been shredded and disemboweled, turkey and gravy has been consumed, both girls collapse together in a moment of holiday quiescence. 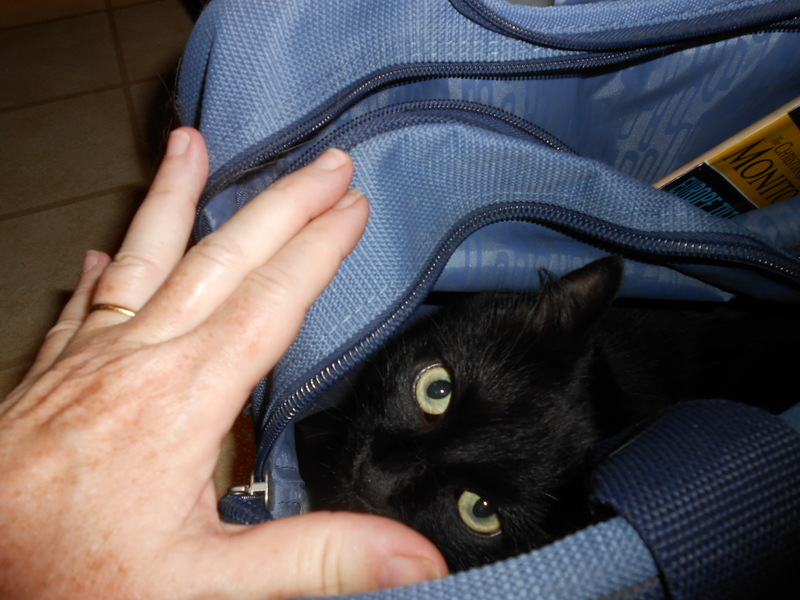 So, the other night, my husband, one of the cats, and I were in the living room watching TV, when we heard a strange rattling commotion in the kitchen. 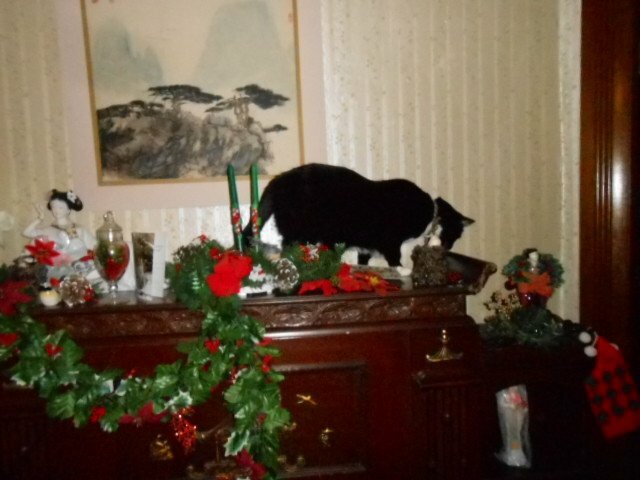 I bravely got up to check. No, I didn’t see either Santa or eight tiny reindeer come early. 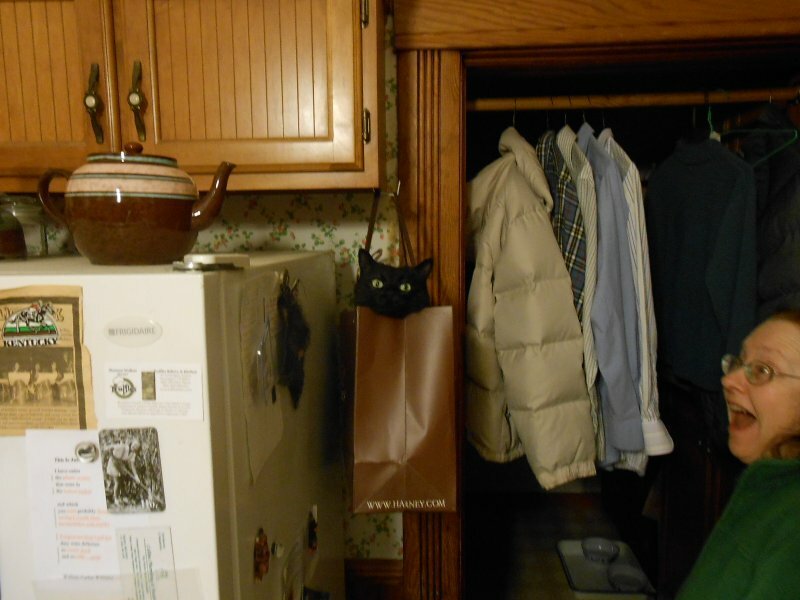 In fact, it took me a moment to pin point the noise, which came from some fancy paper bags hanging by a hook next to the top of the refrigerator. 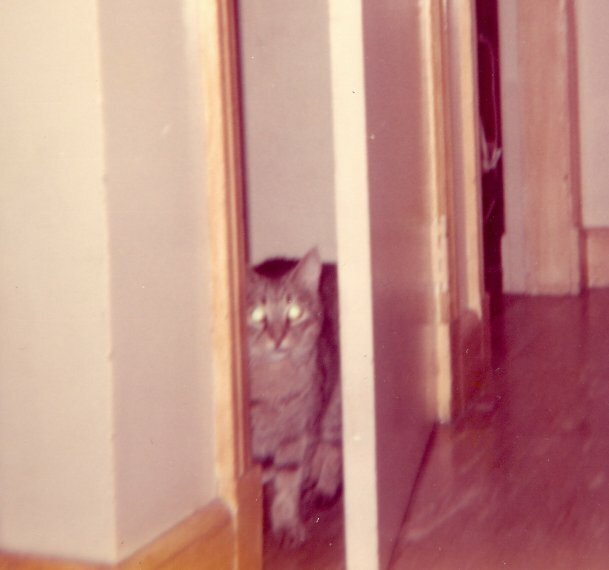 A single green eye peered out at me warily. A call of my friend’s name, and Rosalind poked her head out defiantly, daring me to challenge her position. 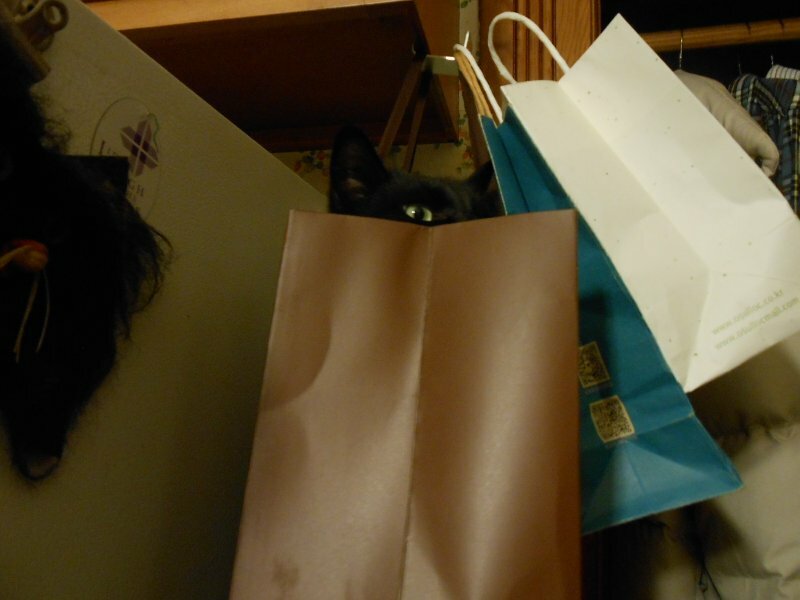 Now, you’ve got to understand, these bags are hanging almost six feet off the floor. Rosie the Riveter had to have jumped up on the counter on the other side of the refrigerator, climbed over the top of it, then slid into the bags. 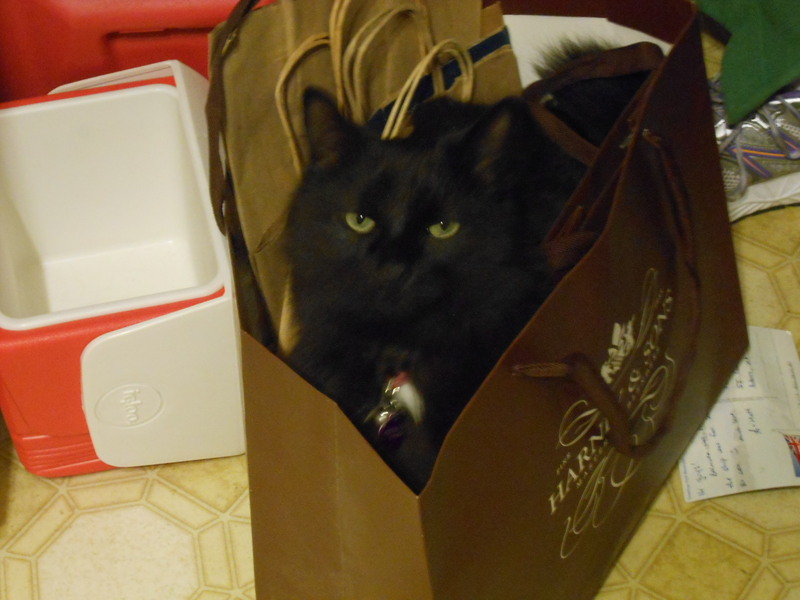 Like her namesake, “She CAN do it!” How she plopped her nine pounds in there without the bags ripping and dropping her plop on the floor is beyond me. Strong bags, I guess. Here, I register shock as Yang commemorates the moment on, well, I guess not film – just digitally. 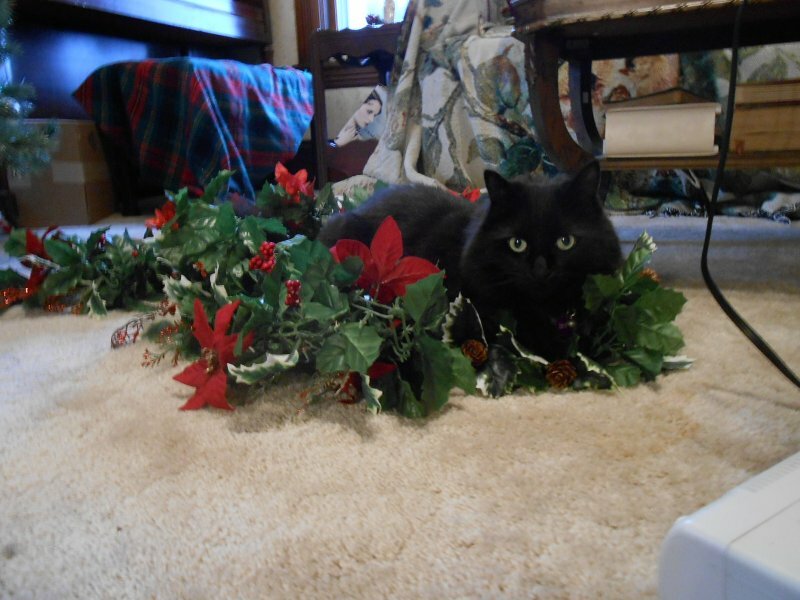 When we lowered her majesty to the floor, she was not amused. Maybe she should train for Army Special Forces or the Navy Seals? Rosalind wants to wish everyone a Happy Autumn! 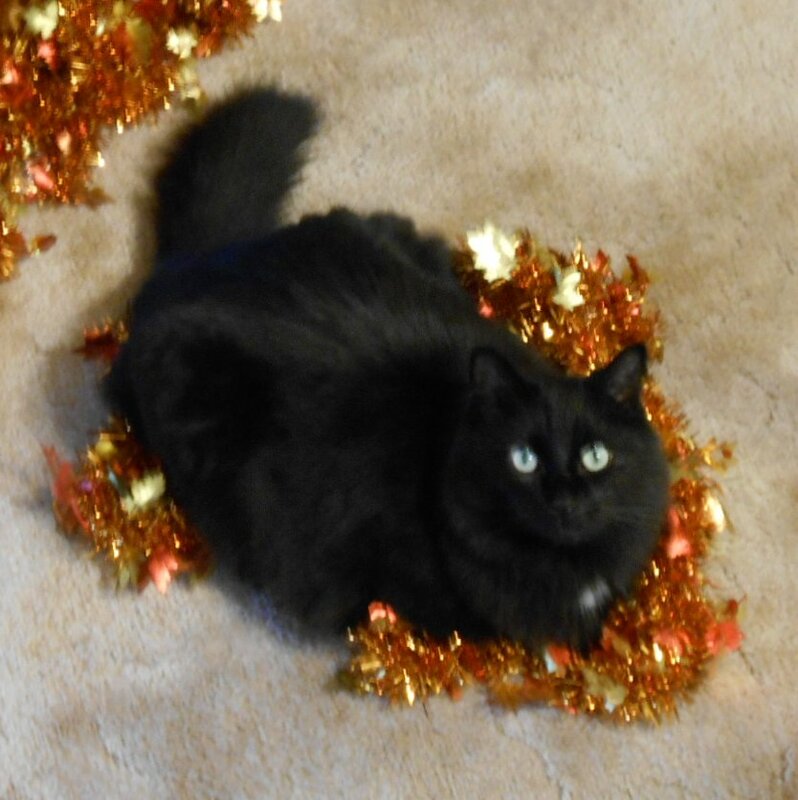 Enjoy a good roll in the leaves, even if they’re only made of tinsel. Stay tuned for Natasha’s Halloween message in October. 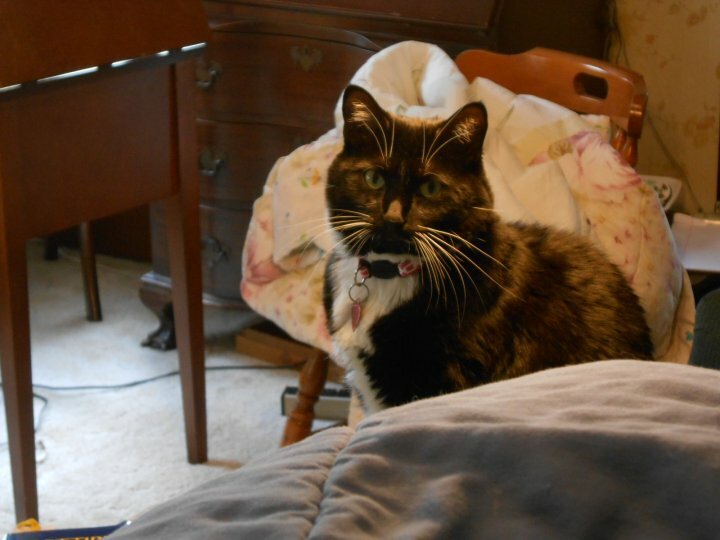 One of my cats, Rosalind, has decided that I work too hard, so, she has elected to join me in returning to the classroom. She will be my C(at) A(ssistant) T(eacher). See, she’s already to head out the door. 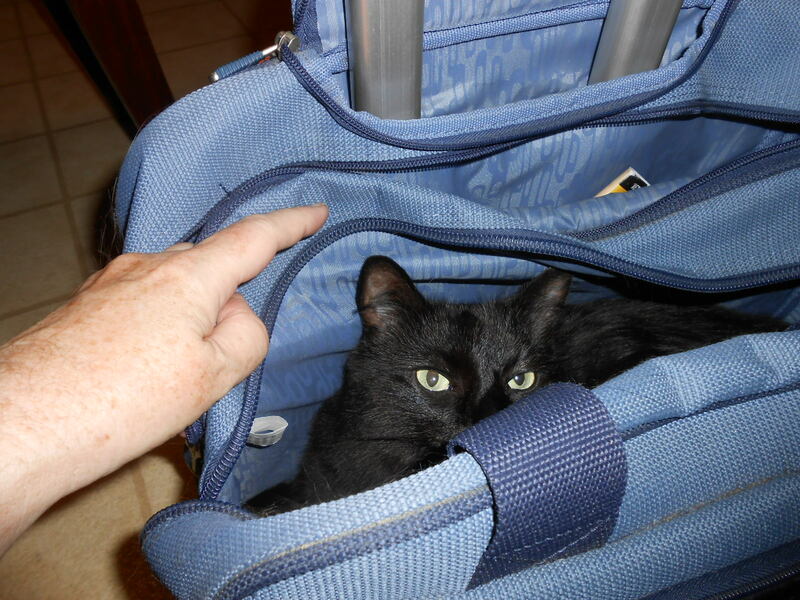 I think she initially intended this as a surprise, as you can see from her surreptitious insertion of herself into my book bag. She may also figure that this is a clever way to check up on people who may be cheating during quizzes. 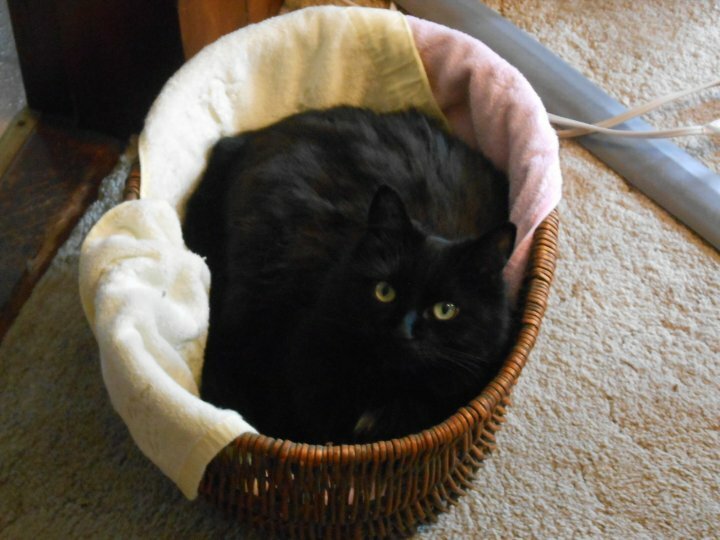 She’s good at catching mice and moles, so cheaters are probably in her repertoire as well. Whatever the case, she will probably be grading some papers for me. So, if you decide to complain about your grade, remember that she has not been declawed – and her fangs are pretty darn sharp. have a nice day.